HomeInfections of the Nervous System in ChildrenEchinococcal Infections of the Central Nervous System in Children HomepageManagement of Echinococcal Infections of the Central Nervous System in ChildrenTips and Techniques for Treating Echinococcal Infections of the Central Nervous System in ChildrenDowling-Orlando Technique for Removal of Hydatid Cysts – Yusuf Ersahin, M.D. The most effective treatment of hydatid cysts is their surgical removal. 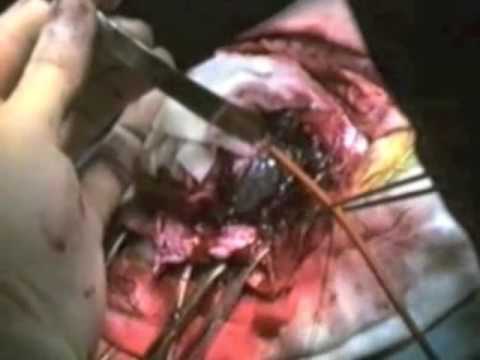 Many reports suggest that the Dowling’s technique is the most effective surgical procedure for the removal of cerebral hydatid cysts (1 ,3, 12, 24, 26, 28, 37, 39). A detailed description of this popular and relatively safe method is given by Carrea et al. (9). Video of MRI scan of a 9-year-old with a hydatid cyst. A large craniotomy is performed to allow for delivery of the cyst without its constriction. A cortical incision nearly the width of the cyst is made, and the plane between it and the surrounding cortex is developed using cottonoids. A soft, flexible catheter is then inserted over the cyst to rest on its far side to the cortical incision. The continuous irrigation with saline through the catheter and slow advancement of the cotton pads or strips usually allows the cyst to be delivered with no ruptures (47).